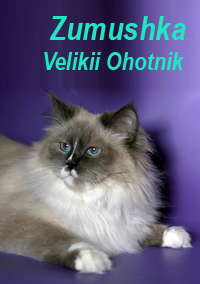 First to appear in our home was Arsenii Velikii Ohotnik, a seal point male. Maybe because of his magic color, maybe because he was extremely intelligent, affectionate and compassionate, we wanted to make his life more comfortable and not so lonely and decided to get him a couple. That is how Iris Velikii Ohotnik appeared in our home. Majestic Lady with incredible blue eyes, very smart and independent. It was in distant 2001. 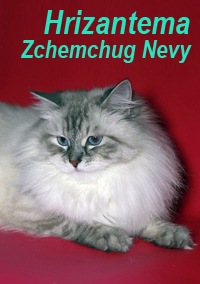 Neva masquerade cats in addition to their magnificent, friendly, affectionate, majestic and extremely intelligent character are very rich in colors. 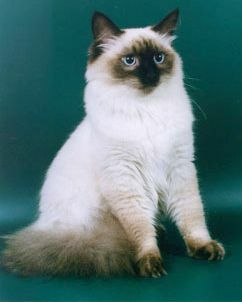 So, in 2005 we decided to buy a blue point female. 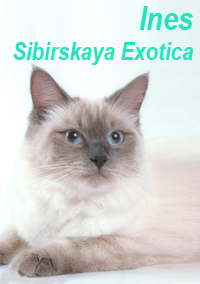 We bought our Ines in Sibirskaya Exotica cattery. 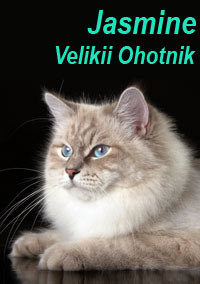 Beauty with white coat ,bright blue eyes and excellent pedigree. 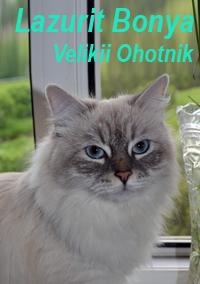 She grew up in chic exhibition cat, with which we drove through many cities of Russia and abroad, winning WCF rings and shows and constantly moving to the goal of the exhibition Olympus Ц the World Champion title. She did it in June 2010 at Moscow World Show! At the same exhibition same title was won by her grandson- Sher Han Velikii Ohotnik from Svataya Rus. 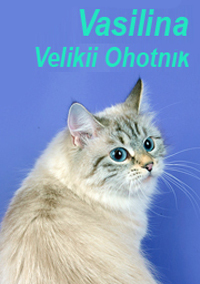 At present, our well-deserved champion retired and raising their descendants, grandchildren and great-grandchildren. .
Our young breeding animals are heirs of Iris Velikii Ohotnik and Ines Sibirskaya Exotica lines, because our attachment and love for our cattery ancestors pushed us in breeding allegiance to these lines and to improvement of their type. 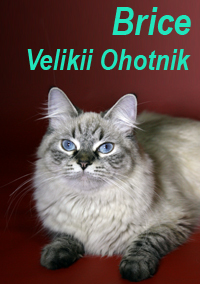 Choosing the best animals from a well- matched pairs, we conducted painstaking breeding work. This work is still going on and improving. 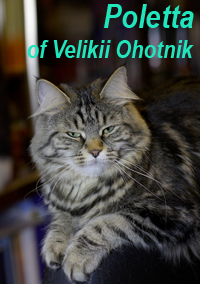 Our cattery has now become collective, we bring together friends and associates who want to make the Siberian breed better, as much close to the breed standard as possible. Our goal is a beautiful, majestic animal, with a beautiful strong body, strong sturdy legs, with the wool distinguished for its whiteness, and contrasted with the color of the points, hanging from the shoulders like a chic water-repellent coat with a lovely undercoat, with bright blue eyes, friendly, kind and intelligent, so that no one could remain indifferent. After all, our cats are first and foremost our family members and friends who fill our lives with warmth and comfort, love and joy, make it better and kinder.